The permission to celebrate the Mass of Blessed John XXIII without any restrictions is a celebrated reality in the Catholic Church. Since Benedict XVI announced the unfettered permission for the restored celebration of this liturgy as the Extraordinary form for the celebration of the Eucharist there has been no celebration of this form by the Holy Father at Saint Peters in Vatican City. There are always media reports about how well this permission has been received by Catholics throughout the world. Many consider this movement as one that restores a sense of Catholic identity and unity throughout the world. Well, with that being said: Holy Father celebrate this rite at the Papal Altar in Saint Peters. There can be no better illustration of the continuity of the sacred liturgy than to have the Bishop of Rome celebrate the Mass of Blessed John XXIII within the center of Catholic worship and government. 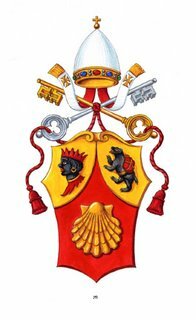 Papal permission for the Extraordinary seems to be rooted in an attempt by Benedict XVI to provide a liturgical bridge for the entire Church that unites us in a consistent liturgical tradition that developed from the Second Vatican Council. Since the close of the council, there have obviously been components of the liturgical movement that have not always gone very well, nor have they been implemented smoothly. Benedict’s celebration of the Mass of Blessed John XXIII over the tomb of the Apostle Peter would go a long way to indicate a new age of Catholic healing and liturgical consistency. With all of the thoughts recently devoted to the Papal visit to the United States, things like the secular and the religious press often overlook the celebration of different liturgical rites. By virtue of his office, the Bishop of Rome always reserves the option to himself to celebrate the liturgy in whatever rite he chooses. Papal prerogative to celebrate the Mass of Blessed John XXIII is of course within the legitimate options for the Pope’s liturgies. 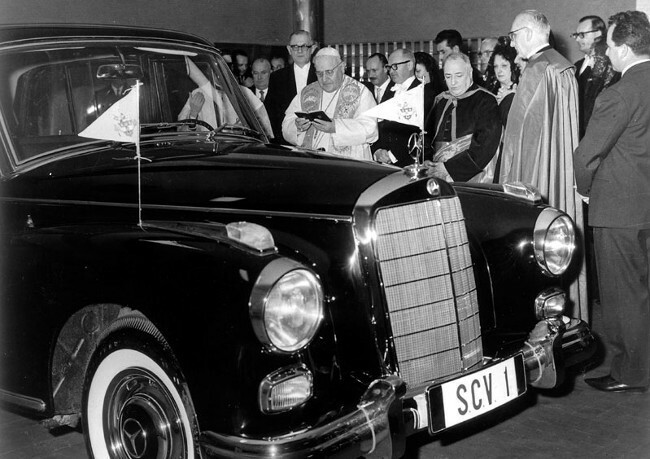 Careful observance of papal events and statements over the past few months, provides a number of clues that the Holy See might indeed be leading up to such an observance of the pre-Vatican II liturgy. Over the past year, we have seen the return of Roman style vestments, the usage of the winter and Easter mozzetta, the revival of the ancient pallium, and rochets coming out of liturgical closets all over the world. It seems only logical that Benedict through his new liturgist is staging the return of some sort of papal celebration of the pre-Vatican II rite. One clear indication of the papal inclination towards the traditional liturgy is the reemergence of the usage of Cardinal-Deacons at papal Masses. In addition to the Deacons of the Word and the Deacons of the Eucharist, Benedict has multiple times recently drafted Cardinal-Deacons to flank him at liturgical celebrations. This is a welcome restoration of papal pomp and ceremony. When one starts to understand the historical nature of various papal ceremonies, the ancient heritage of Catholicism is appreciated by the observation of how we indeed offer solemn prayer. There is also speculation that the Holy Father has initiated new sets of vestments for papal ceremonies that will include the Roman form of chasubles, dalmatics and tunics. 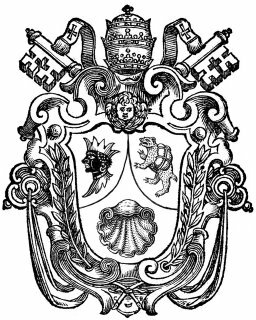 While there should be no expectation that the Papal tiara will come out of retirement, such revival of historical signs and symbols of our Catholic liturgical history are long overdue and very welcome. One aspect of the Benedictine Renaissance that is critical to understand about the Holy Father is that he is not intent on sending the Church into a retrograde motion towards liturgical antiquity. He is just making the most effective use of all of the ceremonial options available to the world’s Catholic faithful people. Advocates are quick to note that these options towards the usage of Latin and the pre-Vatican II form were never abrogated. 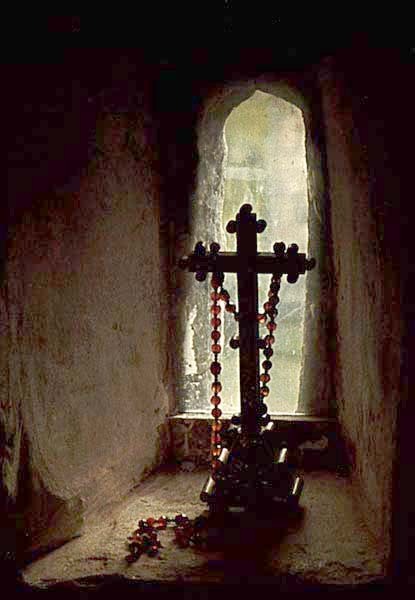 Benedict XVI is showing the world that Catholic prayer and ritual indeed has relevance to all Catholic peoples…because it is a legitimate part of our Catholic heritage. It is most appropriate Benedict XVI make a real gesture of continuity and celebrates the Mass of Blessed John XXIII publicly for the benefit of all Catholics to appreciate and prayerfully worship in the ritual form of our Fathers. Vatican City, 28 March (AKI) – Pope Benedict XVI is a big fan of buffalo mozzarella cheese, and eats it often reported Italian daily Il Messaggero on Friday. Pope Benedict XVI reportedly likes simple dishes and often receives buffalo mozzarella cheese as a gift from bishops from the Campania region in southern Italy where the best buffalo mozzarella is produced. In the supermarket located inside Vatican City, the dairy section is full of mozzarella cheese products from the southern region of Campania. Reportedly, the cheese is prized among priests and nuns who visit the supermarket everyday to restock convents, institutes and monasteries. The cheese, prized for its subtle flavour, costs twice as much as mozzarella made with cows’ milk. 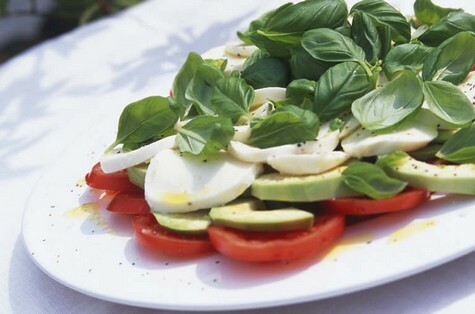 It is eaten on top of pizza and also alongside prosciutto or with sliced tomatoes and basil. Reportedly, and mozzarella cheese is often found in his plate, said Il Messaggero. 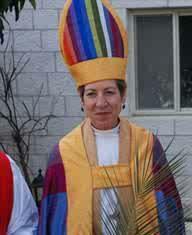 Presiding Bishop of the Episcopal Church, Katharine Jeffers Schori lights up the Great White Way in Joseph’s Technicolor Dreamcoat (and hat). Memphis, Tenn., Mar 28, 2008 / 03:29 am (CNA).- The Saint Michael the Archangel Organization is attempting to organize one million people in the United States to pray the Rosary for unborn babies on Saturday, May 3. Organizers of the prayer event, called One Million Rosaries for Unborn Babies, are asking participants to pray during the same 60-minute time span, beginning at 9 a.m. Eastern Time. “The person battling the ‘Culture of Death’ is primarily in a spiritual battle and needs to use spiritual weaponry,” he continued. The organization is asking Pope Benedict XVI to re-establish the practice of offering prayers such as the Hail Mary and the Prayer to St. Michael the Archangel after Mass. The organization also asks that these prayers be offered for the intention of ending the surgical and non-surgical killing of unborn babies. SOMERSWORTH — The Rev. Aaron Pfaff, a priest at St. Martin Catholic Church, Holy Trinity Church and St. Mary Church in Rollinsford, New Hampshire announced Wednesday he will say his last Mass on Sunday, April 13, and resign effective Tuesday, April 15. Pfaff’s resignation comes after what St. Martin’s Finance Committee Chairman Marty Dumont called a “really tough year” for the priest, who suffered burns in a rectory fire at St. Martin’s in February 2007. After a lengthy recovery from heat exposure and burns on about 7 percent of his body and also picking up the pieces after the fire and restoring the damaged rectory, things took their toll, according to Pastoral Council President FX Bruton. “It’s hard to see him go, but we support his decision,” Bruton said. The rectory will finally be complete and ready to be used once again by next week, according to Dumont. Pfaff has since been living in Madbury on a farm with his dog Grace, a bull mastiff, who was also in the church at the time of the fire but not injured. Dumont said he understands Pfaff’s reasons for resignation and expressed his admiration for the priest’s work at St. Martin’s Church. Bruton emphasized there was a “great amount of support” for Pfaff while he was with the parish and he had great influence on all those who came in contact with him. “His impact is not only significant for parishes, but for a lot of people on an individual basis,” Bruton said. Father Richard Tetu from the Manchester Diocese will be taking over for Pfaff after April 15. 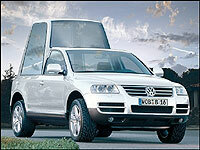 According to Alberto Gasbarri, the chief organizer of papal trips, the white, 2002 Popemobile (a modified version of the Mercedes-Benz ML430 off-road vehicle) has left the Vatican and will be delivered by an air cargo company in early April. 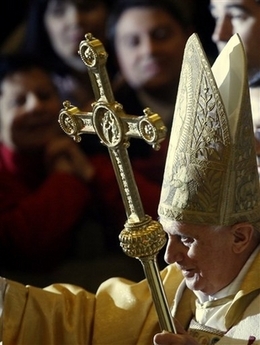 Pope Benedict arrives in the USA in 17 days. 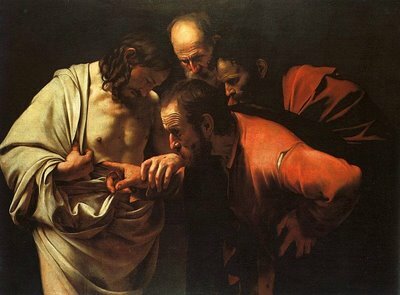 et non tradat eum in ánimam inimicorum eius. A woman came into the sacristy after the 8:00 TLM this morning to introduce herself. She had a missal in hand, and a veil over her shoulders. Peoria AZ and Saint Charles Borromeo parish had been where she’d been raised. She received her sacraments many years earlier at the church. She is presently living in Idaho, and her son is an usus antiquor altar boy back home! She was very excited that the Traditional Latin Mass had returned to her childhood spiritual home. Nice.